Morning all, Fiona here with a bit of Christmas Sparkle to inspire you. I've stepped outside my comfort zone yet again and used GLITTER. But it had to be black glitter for me. I was inspired to make a Christmas bauble so I went to my go to Tando grab bag of circles. I sorted the sizes needed and gave them all a coat of DecoArt Media Fluid Acrylic in carbon Black. Once dry all circles and a medium sized snowflake were given a coat of DecoArt Americana Deco-Page glue matte and then a generous amount of black glitter was added. The excess was then dusted off. All circles were the edged with DecoArt Metallic Lustre in Burnished Brass. 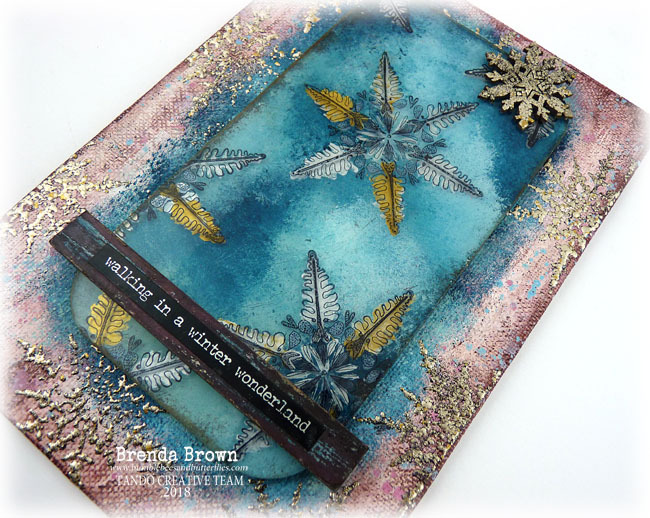 Three Tando Snowflakes ( the large snowflake was specially cut by Di for me ) were then given a coat of DecoArt Extreme sheen Metallic in Vintage Brass. 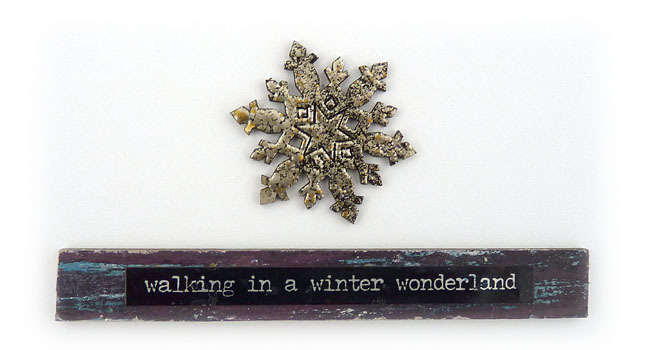 Once dry the large snowflake was then stamped with a text stamp from Andy Skinners Textures Stamp set. 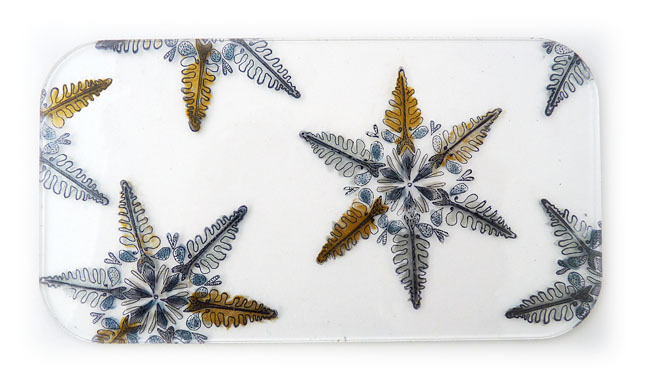 All three brass snowflakes edges were then inked with black Archival ink. Now to assemble the piece. All circles were laid face down and lined up. Then to attach them all together to form a complete piece a coffee stirrer stick ( the ones you get in the coffee shops) was glued to the back of the circles in a complete length from top to bottom. 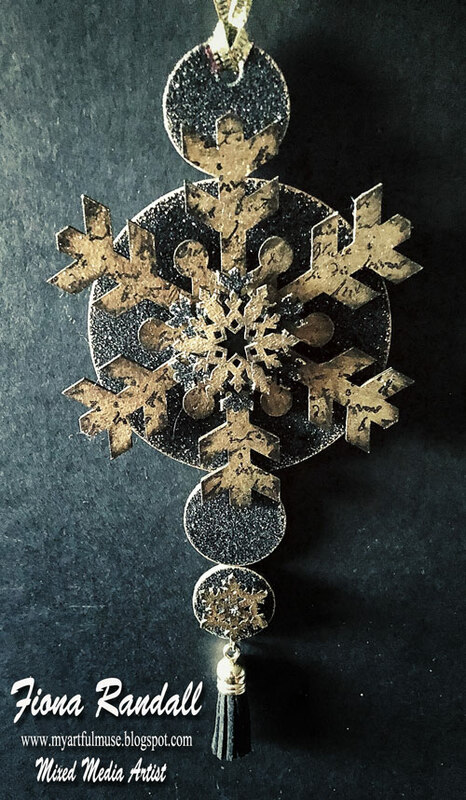 All three snowflakes were then layered onto the large centre circle using grey board offcuts to give depth and dimension . The tiny snowflake was added to the bottom small circle and a tassel added to finish. Tando Grab Bag of Circles. 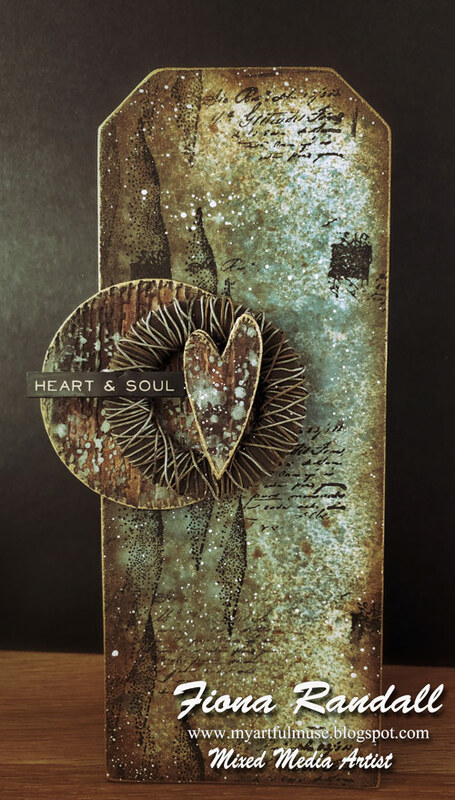 DecoArt Media Fluid Acrylics and Mediums. Ranger Black Archival Ink Pad. 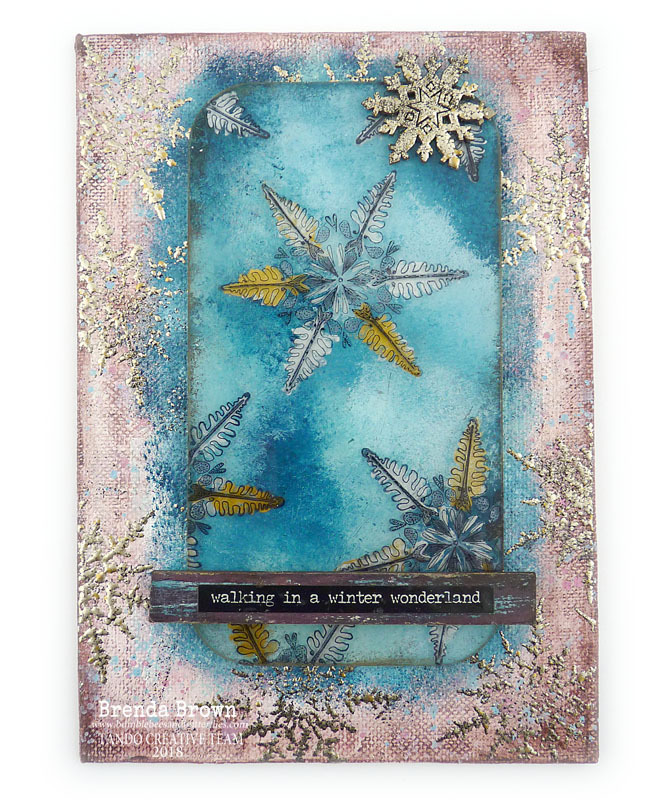 I started by coating the Tando Creative grey board ATC cards with white gesso then once that was dry added a coat of white crackle paint. 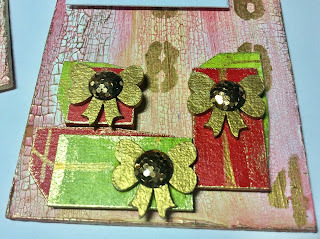 Using the mini parcels and bows from Tando I painted them with the same two colours plus metallic gold. 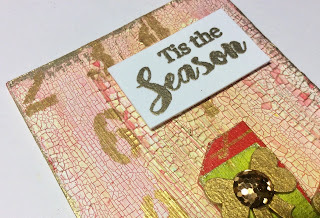 I edged the presents with gold gilding wax (and the edges of the ATC's) before layering them up and drawing on ribbons with gold gel pen. 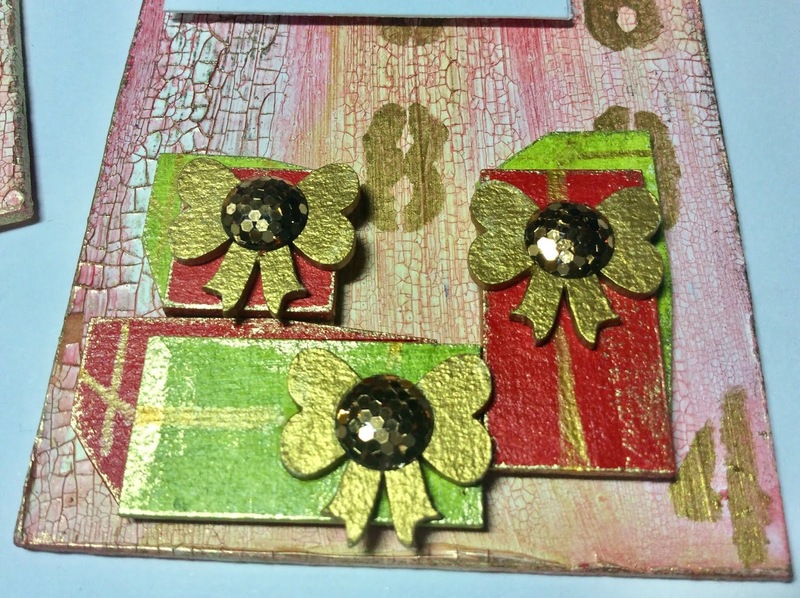 Finally I stamped and gold embossed the sentiments onto white card and added some gems to the centre of the bows. Morning all Fiona here with my contribution to the Colour Theme Week. This is a first for me working from a colour palette, but I'm pushing my boundries and coming out of my comfort zone to see where it takes me. I used two media boards to create a little notebook. 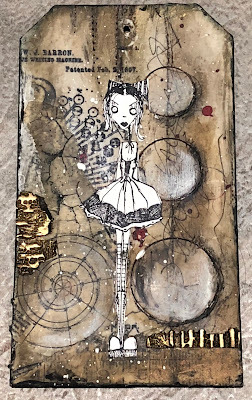 Got the gelli plate and brayer out and away I went. So here is my little notebook completed. 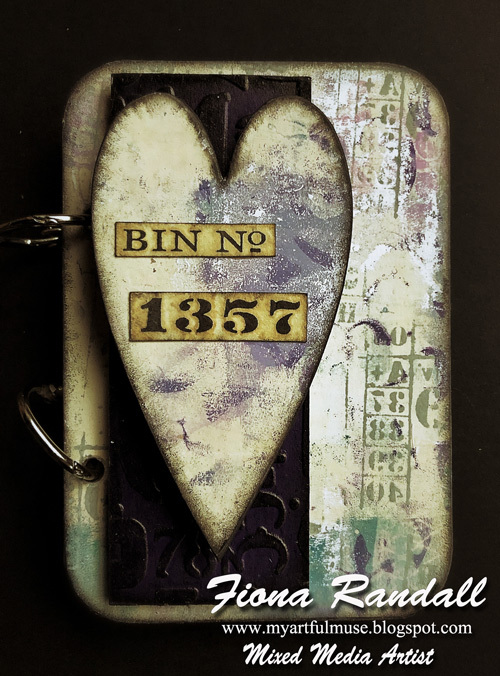 Complete with some additional stamping an embossed panel and a grey board heart. Hello, Carol with you today with my last colour theme post for 2018. This year, each month, I have created a mixed media board in the months colours and I now have a lovely 12 making up my 2018 set.. 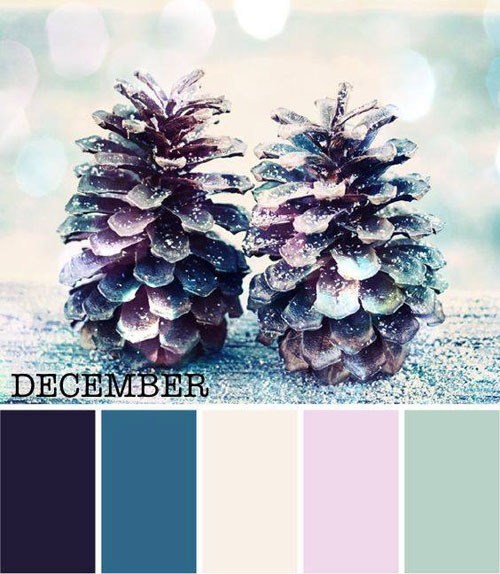 Welcome, it's Brenda here with the start of the December Colour Theme week and what a gorgeous palette it is. 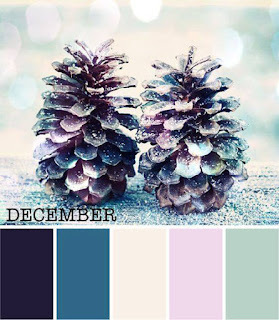 Don't you just love the contrasting shabby tones and those pine cones reflecting the colours? I decided that to do this justice I needed to focus on some colour mixing and I used one of my charts to record what I did. Of course it's impossible to say how much I used each time but I always add less than I think I need because I can always add more but can't take it away! But I'm pretty pleased with the closeness of the colour shades (from left to right) #s 1, 4 & 5. 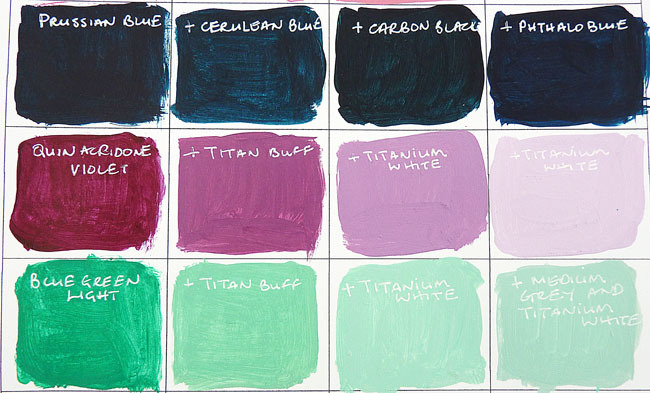 #2 is represented by cerulean blue and #3 is titan buff. 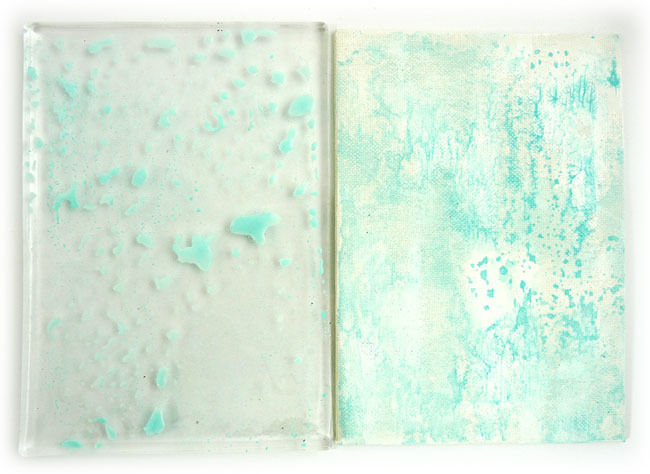 So here's my finished mini winter sketchbook. With watercolour pages inside and two magnets to hold the flap closed. There are some process steps over at Bumblebees nd Butterflies if you'd like to see how it all came together. Thanks for stopping by and enjoy your week. 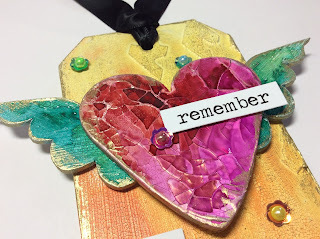 This week on the Tando Creative blog the theme is to use patterned papers. 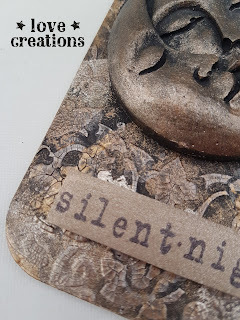 I chose two coordinating pieces of patterned paper to use on my MDF and greyboard pieces. Using decoupage glue I stuck my pieces to the papers then once the glue had dried cut the shapes out roughly then used a sanding block to create a nice edge around each piece. At this stage I added some holes with a crop a dile for my wire and some distress ink around each of the pieces using a duster brush. If you don't want to use paint and mediums then paper is another great way to cover your Tando plaques, tags and media boards. There will be more ideas from other members of the team through the week. It is "Anything goes" week so I've decided to make something a little bit more festive for you. For my project I'm using media board from Tando. To start with I've applied Decoart Crackle paste through stencil, and I've left it until it was completely dry. Then I've added a wash of Decoart Media Acrylic paint in Carbon Black all over the crackle. Next step was to add a little sparkle. 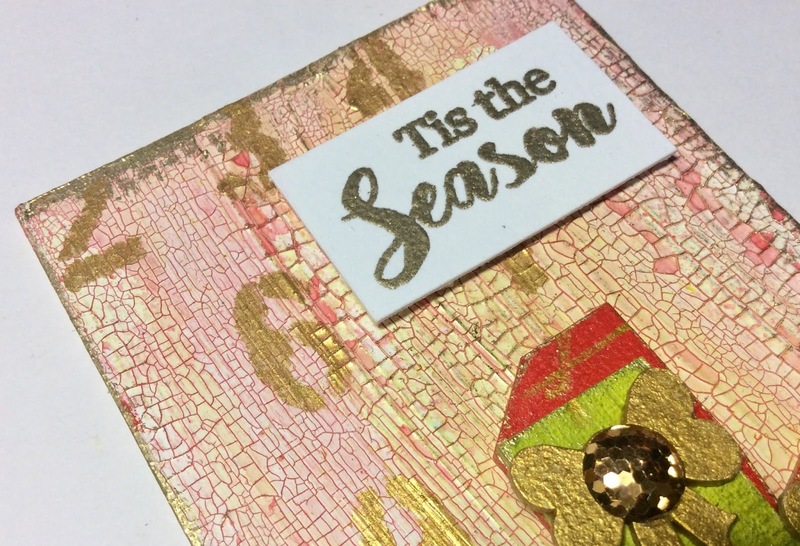 Using Decoart Dazzling Metallics in Medival Gold, Champagne Gold and Splendid Gold and sponge I've highlighted the areas. 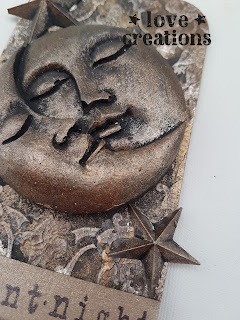 Stars and moon embellishments were painted with DecoArt Americana Chalky finish and then painted with Dazzling Metallics as well. 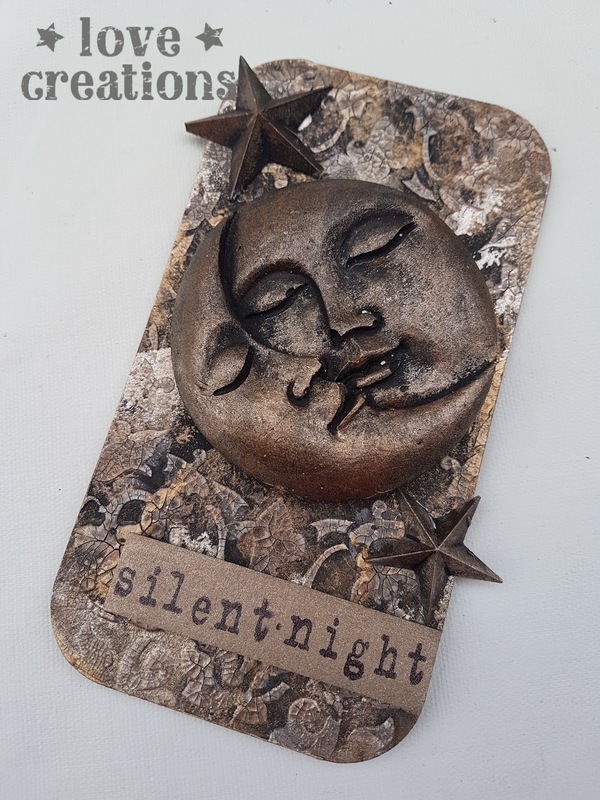 I've also added a little Silent Night sign. 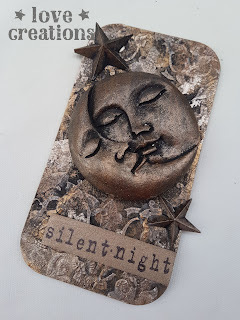 Today I'm sharing with you some Artist Trading Coins I made for a swap with a lovely friend. I had missed the deadline to enter and she offered to swap just with me, so it was really nice and personal to trade coins. 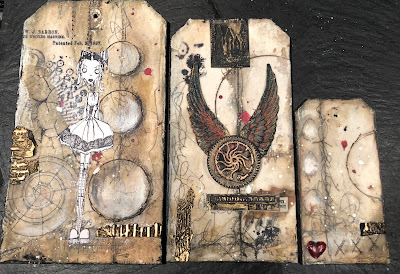 We made three coins each, using Tando Creatives Artist Trading Coins made from Greyboard, which takes practically anything you throw at it paint wise. These were my gorgeous coins from my friend, I love the fact they are 3 similar coins, and I had a thought to put them on the front of some mini drawers or something as decoration at some stage. 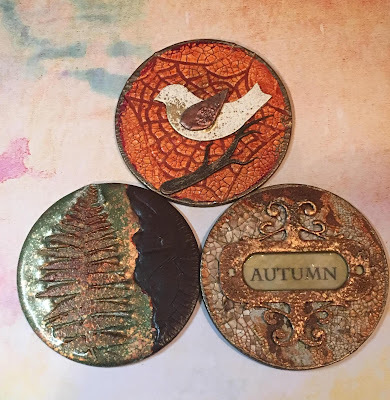 I made three coins also, and had fun following the Autumn theme. 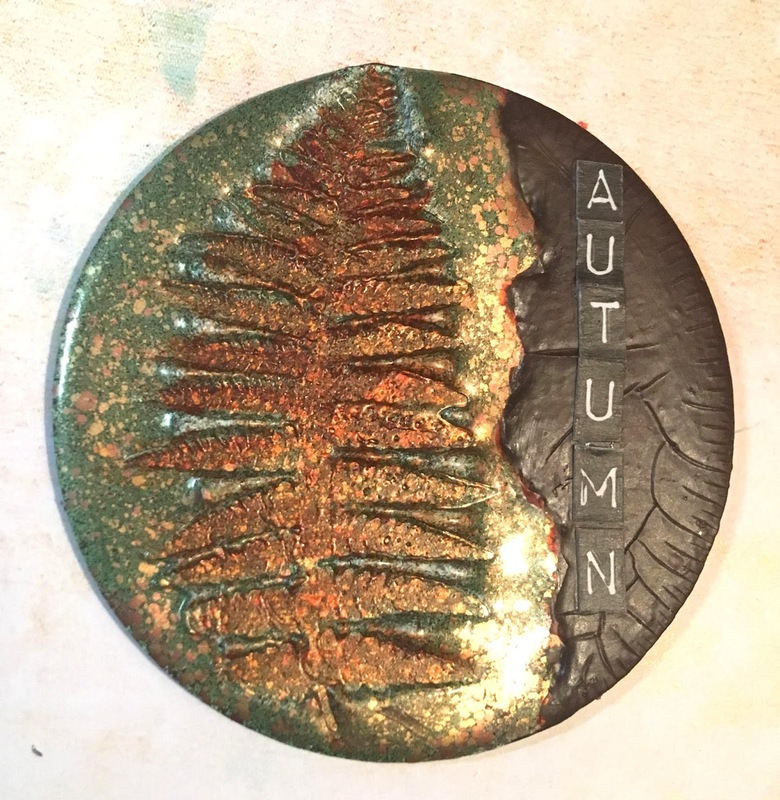 The Leaf coin was triple embossed and a fern leaf stamped into the hot embossing powder. The other side was painted with a rust technique, and then I used crackle glaze. I wasn't happy with the finish so painted the rust back over the crackle glaze, which added effect. The word Autumn was added from stickers from my stash. 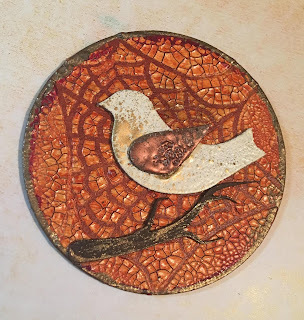 The bird coin was first painted in Crackle paint, and then given a coat of quinacridone gold. The tree branch was painted in raw umber, and highlighted with Metallic Lustre. I embossed the bird and wing in two colours, and then edged the coin with Quinacridone Magenta. The final coin was painted with Tinting Base, and then given a coat of crackle paint. When dry and cracked, I gave it a wash of Raw Umber, and then Quinacridone Gold. 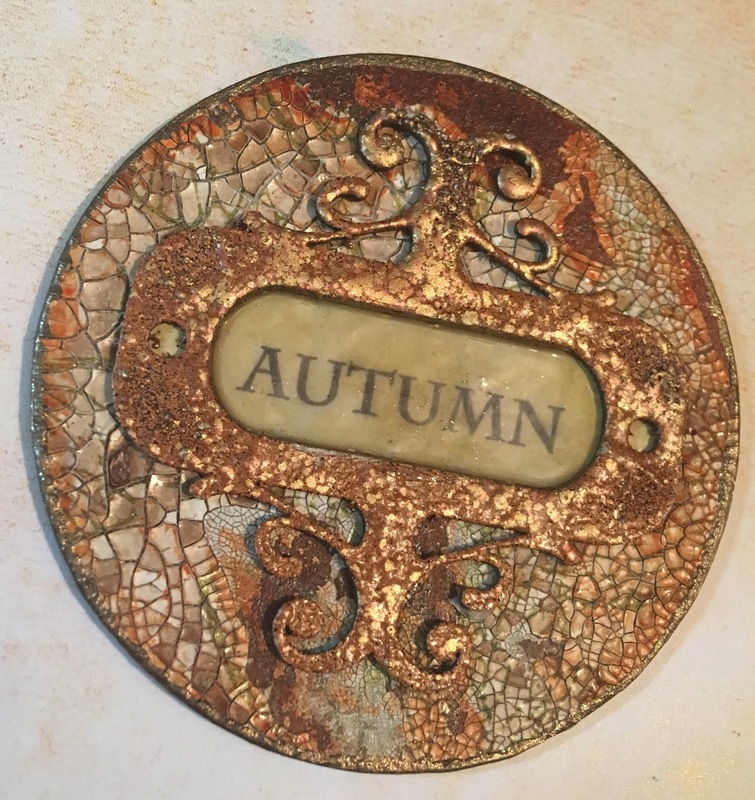 I used a bookplate and embossed, and added the word Autumn. I put Triple Thick Glaze over the word inside the bookplate. Hope you like them, I enjoyed the process and swapping coins is great fun! Andy Skinner Fossils Stamp set (Fern). 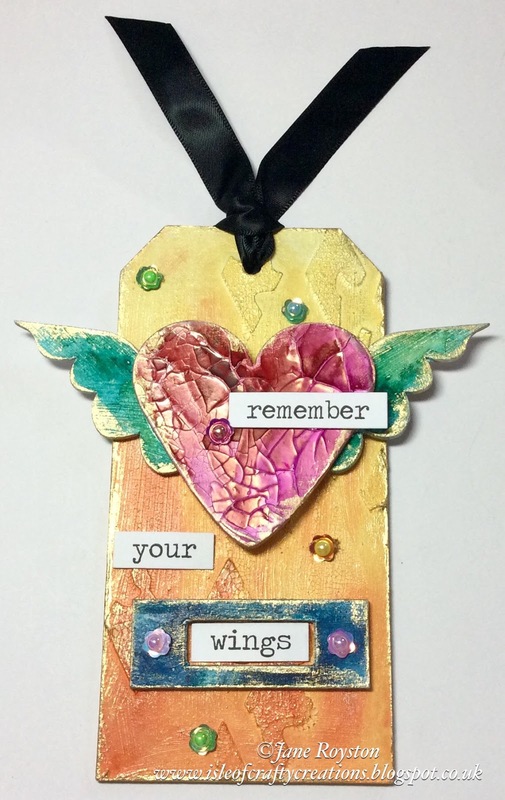 Hi everyone Dee here with the other two tags were done at the same time as the winged one. I am in the middle of packing for MOM really excited to be seeing everyone. Always think I am going to behave at this one, it never happens I blame that Suz! but I do try. I used 3 different sized tags, scribbling, Stamping, beloved deco Art media acrylics and oil pastils. Here you can see the scribbling that I did prior to applying the wax the circles were done after the wax had been applied then a white oil pastil was used to highlight the circles. I used metal tools to carve into the wax then Raw umber was rubbed into the patterns created. 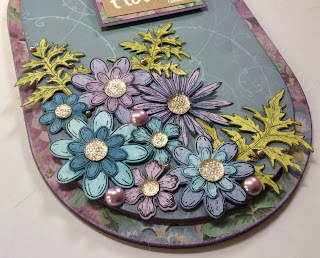 For the embellishments i used my fav triple embossing. 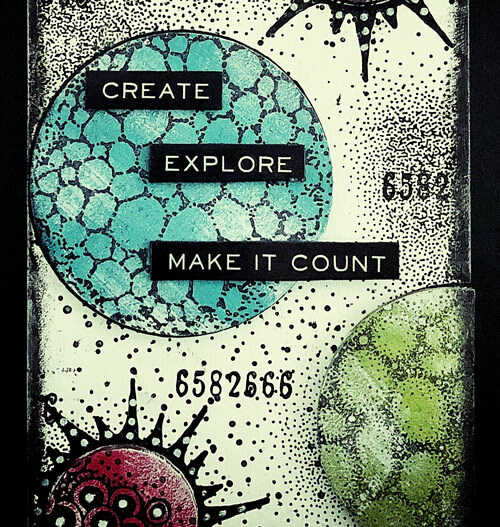 I used a Tando Media Board for my base and grey board circles for my focal points. Cut from sturdy grey board they will take anything you care to throw at them Paint or medium wise. 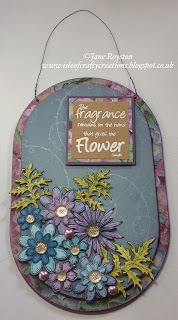 I started by giving the media board and circles two coats of DecoArt Media Tinting base. I then placed the circles on the media board for placement and lightly drew around them with a pencil to determine where to stamp. I then gave the circles a coat of DecoArt Media Fluid Acrylics in Cobalt Turquoise Hue, Green Gold and Primary Magenta. When dry the circles were stamped with the Texture Fragrments Stamps from Chocolate Baroque with black versafine ink. The media board then had stamping applied using a number stamp from Andy Skinners Illusionary Artists stamp set word up and numbers. The circles were then glued to the media board base and doodling applied to the small circles to make them stand out. Finally the media board edges were inked and word strips added relating to how I felt about working out of my comfort zone. Do come back to see what more inspiring makes from the team. Black Sakura Fine Liner Pen. Morning all the Team are playing with Spray Inks/ and or Paints. Here's my contribution a Rusty Grungy Paint Sprayed Tag. 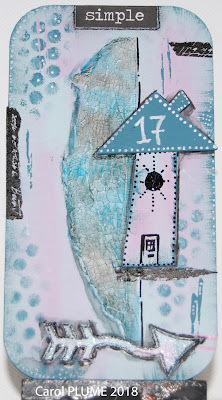 I started by priming all my greyboard pieces with DecoArt Media Tinting Base. 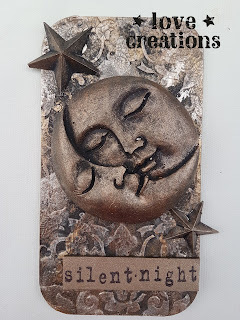 I then Used DecoArt Media Fluid Acrylics in Prussian Blue Hue And Raw Umber mixed with a little Carbon black to make a darker brown in a couple of mini mister bottles to make my spray paints. 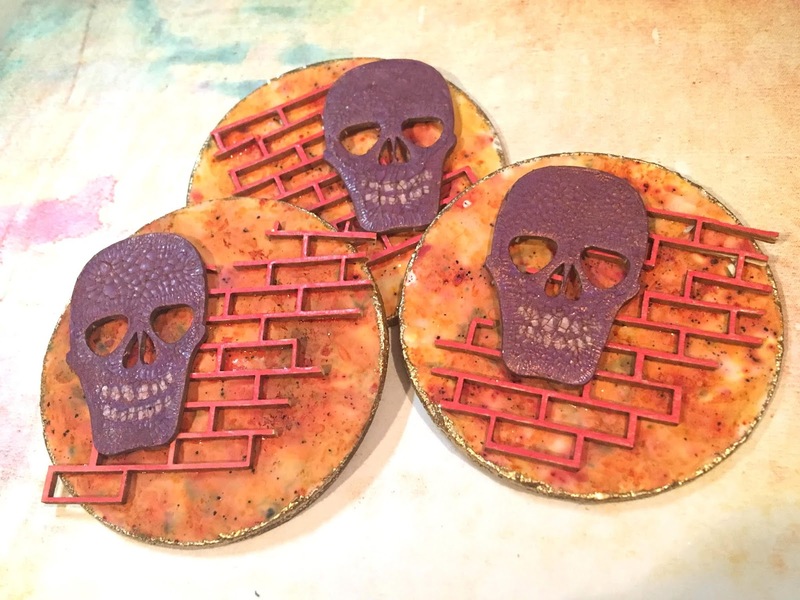 These were then misted onto the tag base and dried between layers until I got the effect that I was after. 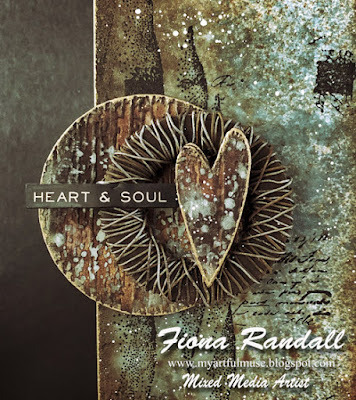 Next up DecoArt Media Modelling paste was applied through a woodgrain stencil to the greyboard circle and Heart and once dry spritzed and sprayed with the Raw Umber Carbon black mix. Again drying between layers to achieve depth. I then applied DecoArt Media Fluid Acrylic in Raw Umber to the large Washer from Andy Skinners Industrial Elements set. When dry it was bound with Rusty Wire. 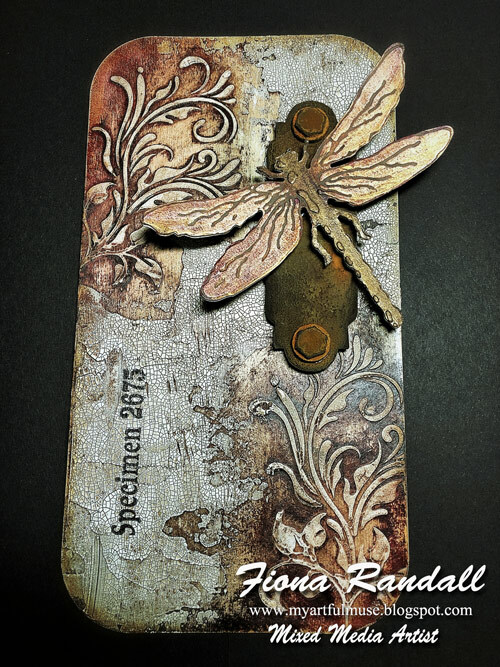 Stamping was then added to the tag base using France Papillion's London New York Stamp set from Illusionary Artists .Potting soil Archival Ink applied to the edges and finished with a swipe of DecoArt Metallic Lustre in Burnished Brass. 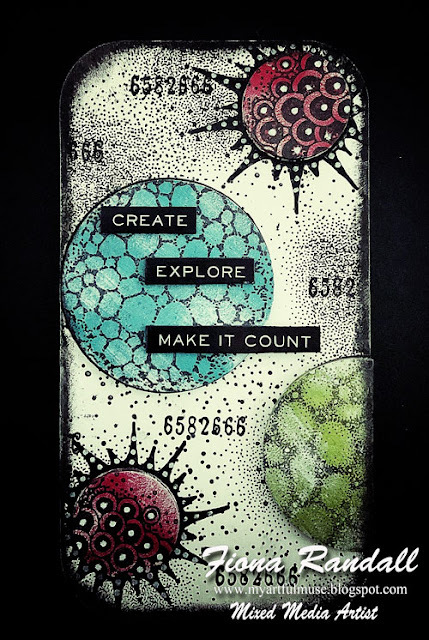 Splatters of DecoArt Media Fluid Acrylic in Titanium white applied to finish the Tag Base. On the Greyboard circle and Heart DecoAt Media Antiquing Cream in Patina was applied to my craft mat and water added to make a wash. The circle and heart were then dipped into it to create spotting and splatters. 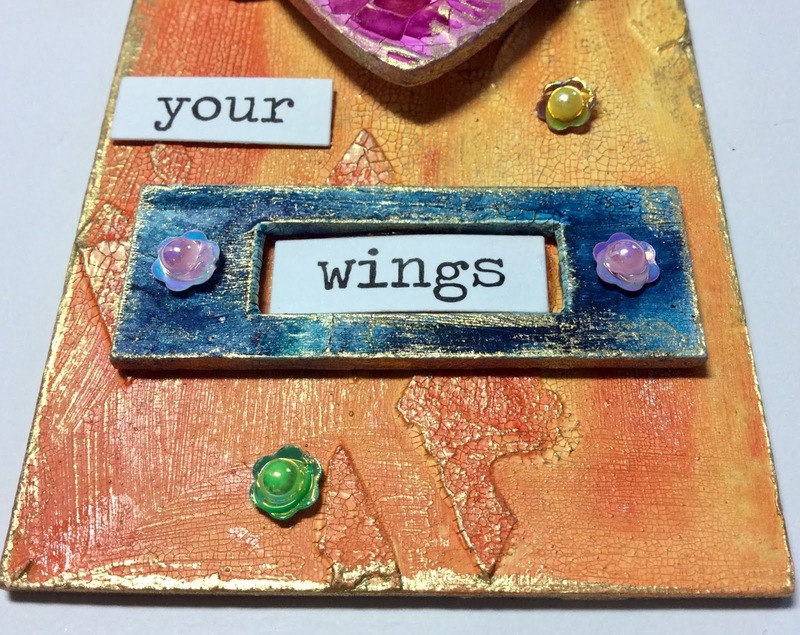 All pieces were then assembled onto the tag base and a sentiment added to finish. Andy Skinner Industrial Elements Kit. France Papillion Illusionary Artists London New York Stamp Set. 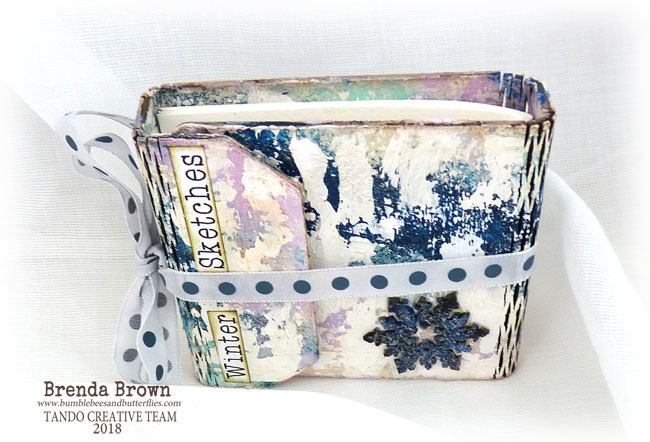 DecoArt Media Line Paints and Mediums. 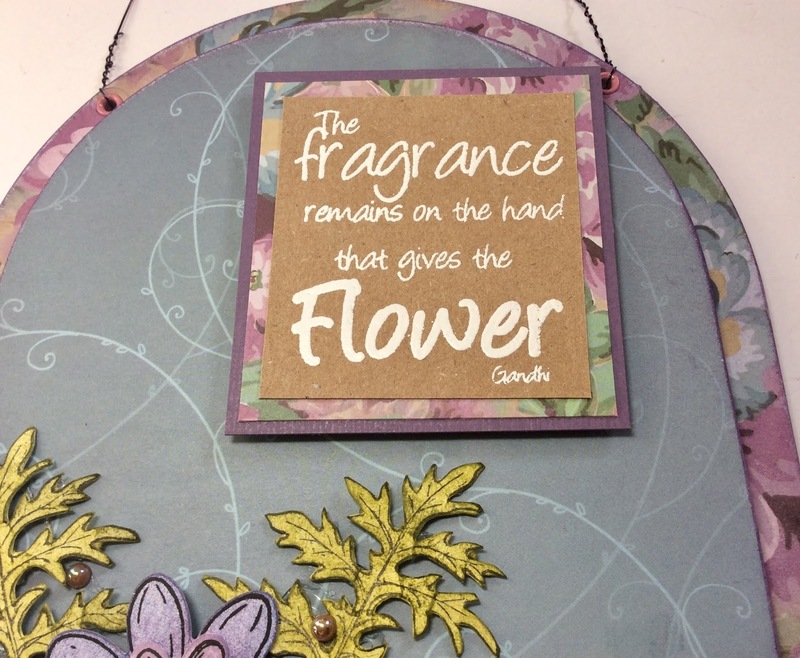 This week on the Tando Creative Blog the design team are using spray inks and/or paints. I love using spray inks and have quite a selection in my crafty stash! In particular I like using the sprays over crackle mediums as I like the way they react with the cracks. 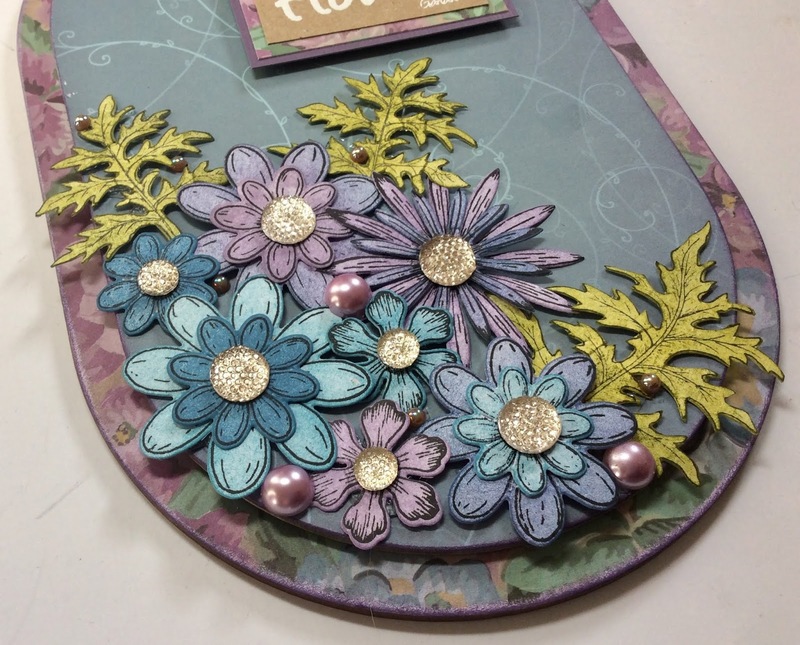 To complete the project I added some Tim Holtz stickers and then some colourful sequins to which I added some tiny flat backed pearls. There will be more inky and painty inspiration from the team throughout the rest of the week. It's a colour theme this week and here is the gorgeous palette. Winter is definitely heading our way. 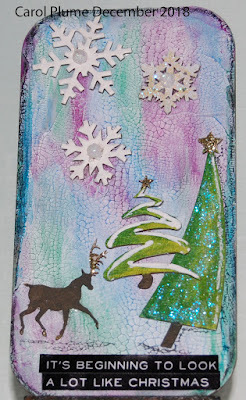 I created a canvas board and used one of the Tando acrylic media boards, a Tando snowflake, DecoArt media acrylics and Stampendous aged silver embossing enamel. 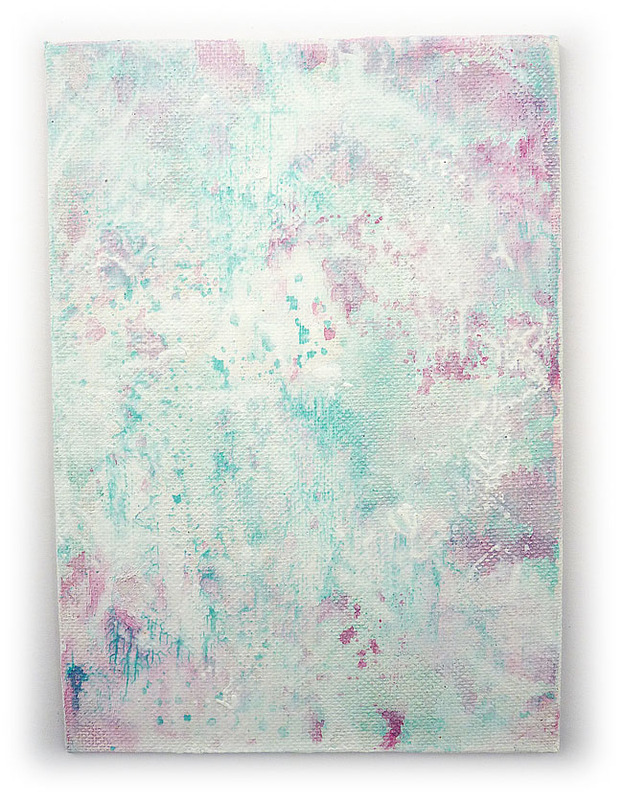 The canvas board went through a couple of transformations but to start off I partially and randomly painted some broad brush strokes of white gesso over the surface and dried it. I took out a palette of cadmium red hue, quinacridone magenta, cobalt turquoise, raw umber, carbon black, titan buff and titanium white media fluid acrylics to mix and make similar colours as those in the colour swatch above. Mixing the light blue colour first I made a water wash on a gelli plate and laid the canvas board over it to soak up some of the colour. 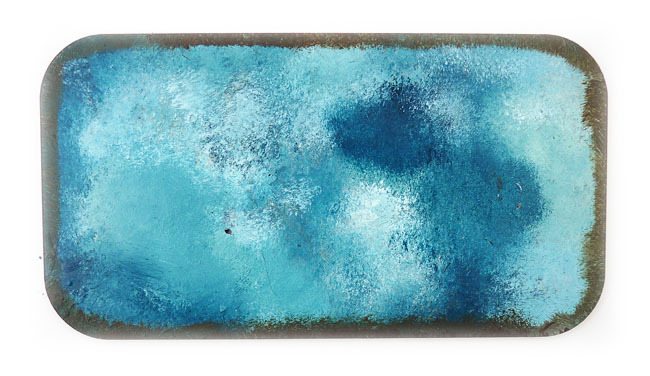 I spritzed the gelli plate with water over the remaining blue wash) and dipped the board again. I took some of the colour our by dabbing with a paper towel. 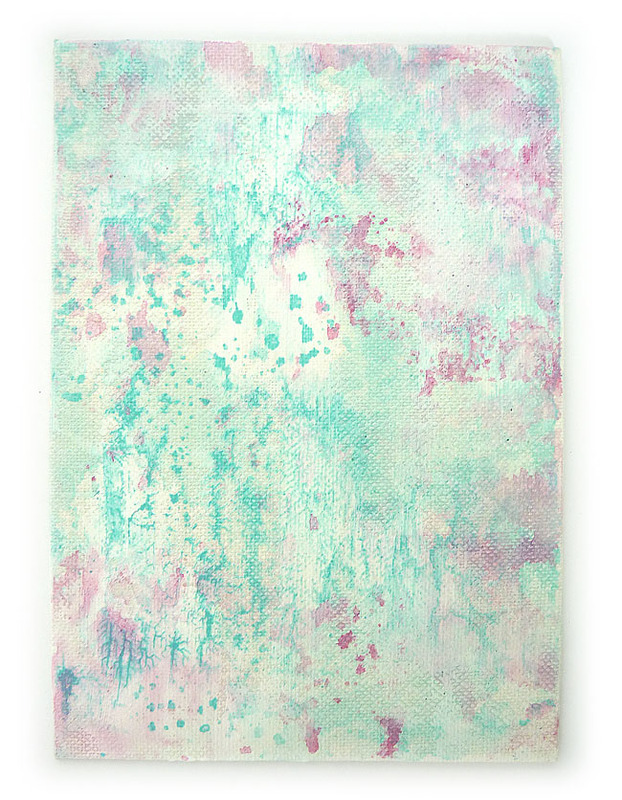 And then I knocked it back a bit and made it more ethereal by dipping in a watery wash of gesso. 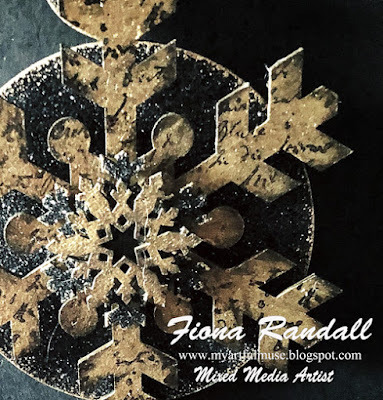 I found a really old wood mounted Penny Black stamp with this really pretty snowflake. 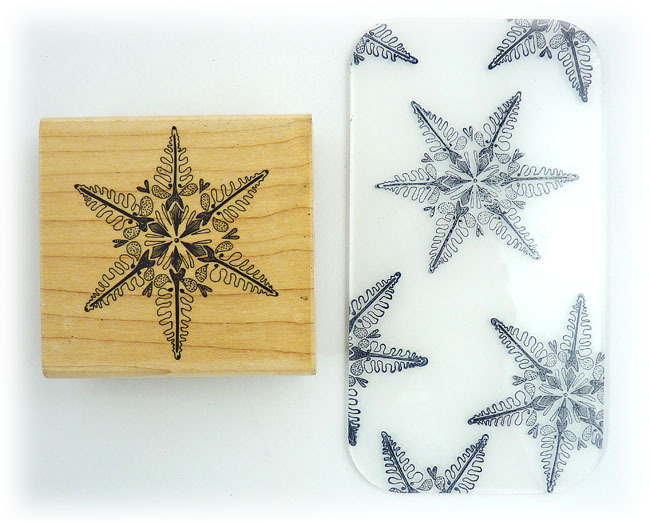 Take off the protective paper from one side of the acrylic and stamp it using black stazon ink. Remove the paper from the other side and start painting the arms of each snowflake in silver, gold and pearl metallic paints. 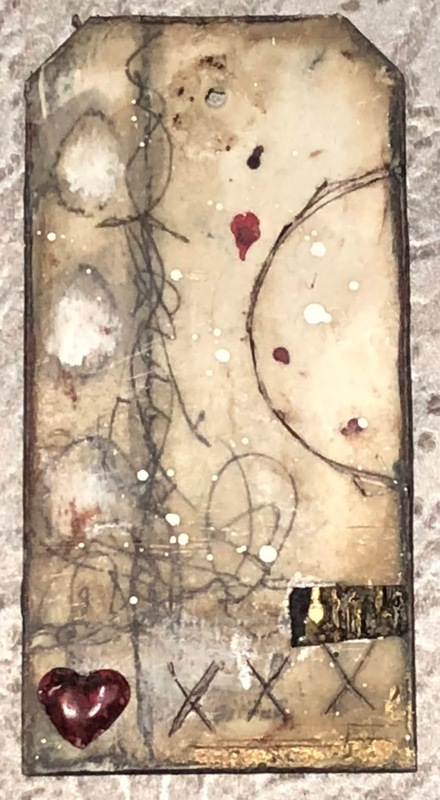 I think I chose quite a difficult image so it didn't go too well ..... but I took a little cloth and dabbed on some surgical spirits and was able to rub some of the messy edges away without scratching the surface. ...... and how it looks ok on the other side. Next using a stipple brush dab over titanium white, titan buff and prussian blue hue on the back of the acrylic, I also used a little burnt umber round the edges which gave me a little frame effect. We will cover all the paint we have already put on the snowflakes. 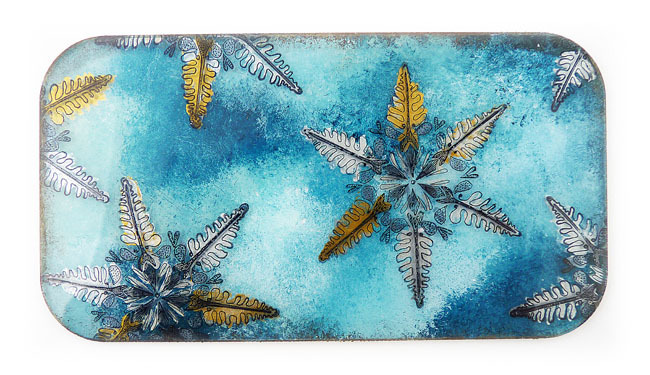 When we turn the acrylic panel over the snowflakes in all their glory are revealed in the dark sky. Once I knew what this looked like I could get back to finishing the canvas board for it to sit on. Take the cadmium red hue, quinacridone magenta, carbon black and burnt umber media fluid acrylics again and mix shades to match the darkest red on the colour palette at the top of the post. 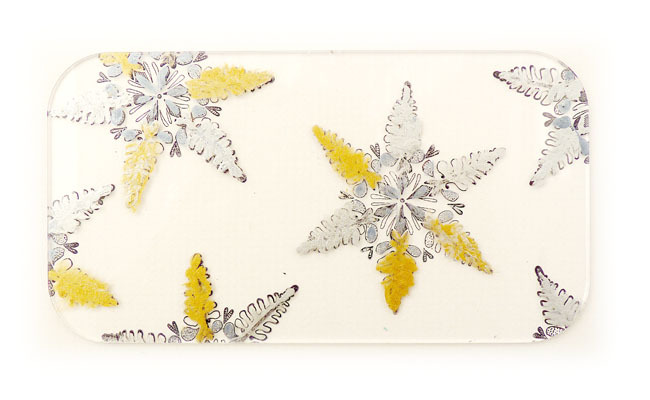 Mix it with glazing medium and paint it round the edges of the canva board and rub back again. It worked well but was looking quite grungy so I totally changed the image. 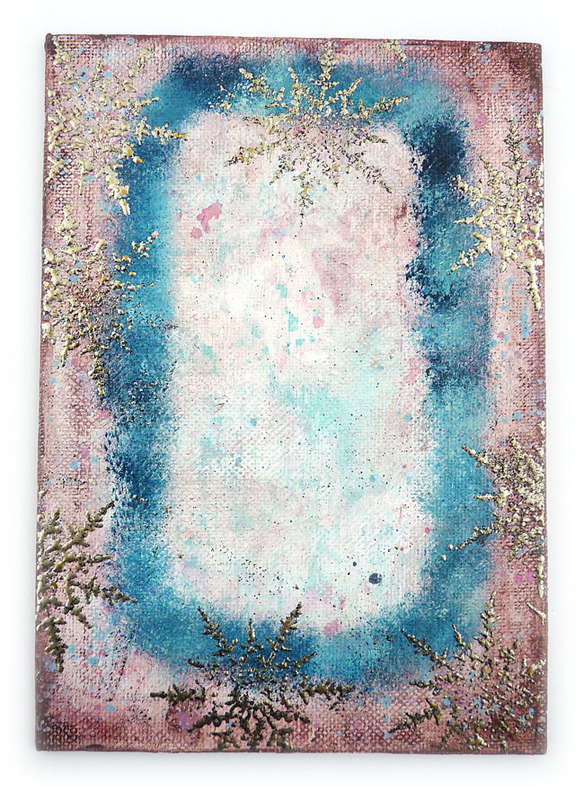 You can see with aged silver embossing enamel and some stippled blue, plus some blue and pink splatters it changed quite considerably. But that's what we do isn't it - change direction and follow our muse? and I was ready to assemble. 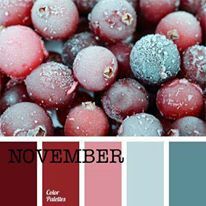 Hello, Carol with you this lovely Monday morning to kick start this months colour theme. 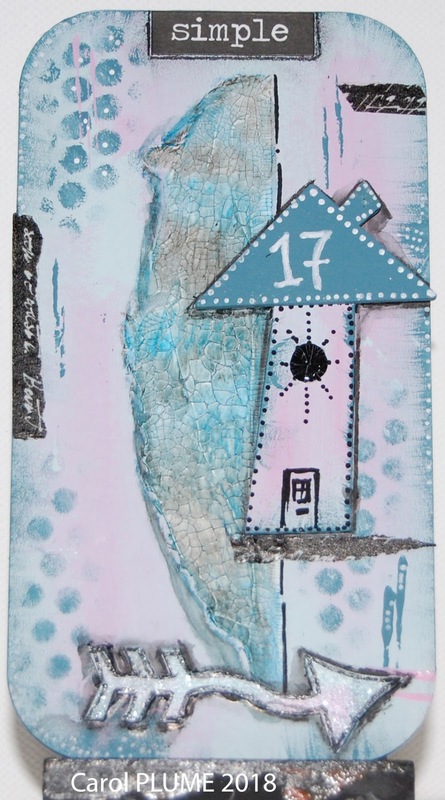 The base this month was the 74mm x 138mm chipboard mixed media board. 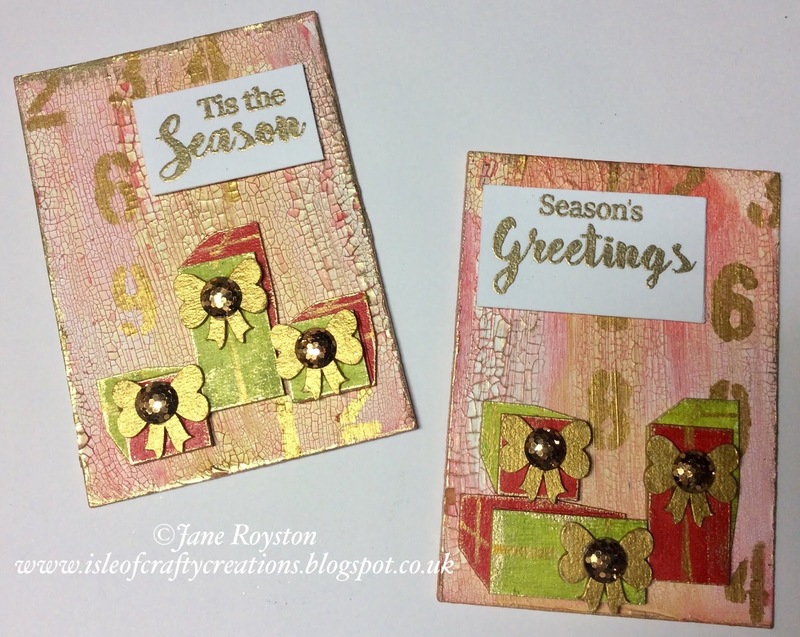 Each month I try and use all of the listed colours, but, this month I decided to stay with just three….